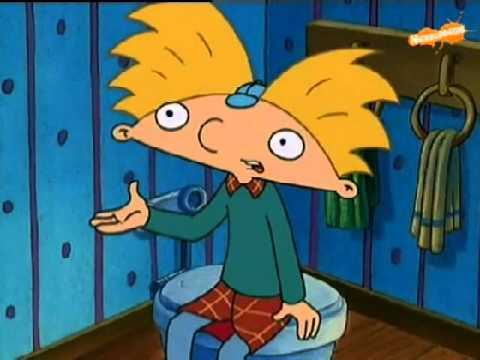 You may remember Hey Arnold for Stoop Kid, Helga's unrequited love, or, of course, the main character's unforgettable football head. You laughed along as the gang navigated the sticky situations that come up in middle school. But you probably didn't catch all of the adult jokes in the show. Maybe you noticed your parents giggling mysteriously at certain moments while you obliviously smiled along with Harold or Grandpa. Well, they were probably laughing at one of the many dirty jokes in the cartoon. Check out these list of adult jokes in Hey Arnold to find out what you were missing the whole time. You'll never look at cartoons the same way again. It wasn’t a single distinct moment that revealed this, instead it was the sum total of her actions and behaviors. Helga's mom slurred her words, made “smoothies,” dozed off in random places, had her license revoked, and was once required to do community service. That last part sounds a whole like the punishment for a DUI. Arnold was pushing his Grandpa to go back to school to get his diploma, but Grandpa claimed he didn't have the brain cells to learn because of Woodstock, which is obviously a place where many a drugs taken. On season three episode “Arnold’s Thanksgiving,” after Helga and Arnold leave a dinner, you could see something... interesting happening in the window. What exactly is it? Well, it appeared to be some type of inappropriate act happening in plain view, though it was actually supposed to be people arguing in the kitchen. Still, surely those responsible for drawing that knew what the positioning looked like.